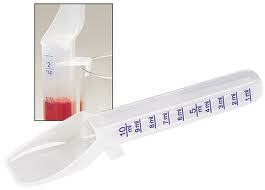 This specially designed 2 tsp Medicine Spoon is calibrated to deliver an accurate volume of medication every time! The Handy Hook allows you to fill the spoon with medication and hook it to the edge of any glass of water or juice while preparing the medication for administration. The ‘Twin Pack’ allows you to always have a clean spoon handy. Top rack dishwasher safe.